Certainly, buzzwords are key to marketing and successfully introducing new products in a glutted market. Many of them, like “Organic” afford the opportunity for the producer to charge even more – regardless of what the term actually stand for. In that realm, it is refreshing to see a large brand giving the buzzword a kick-in-the-pants while still drawing the financial benefits from it. 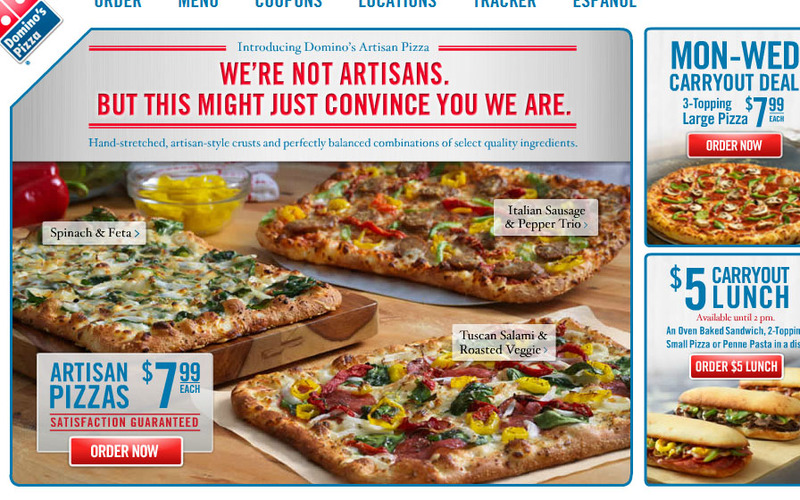 In this case, the word is “Artisan” and the glorious offender is Domino’s Pizza. They are actually treating it the perfect way for their brand – their customers would have left a long time ago if they actually cared about highfalutin pizza gastronome. Domino’s management seems to know it and they are having fun with it. The tag-line of “We’re Not Artisans” above the call-out to buy their Artisan Pizza clearly presents the tongue-in-cheek treatment of the branding. Perhaps the toppings are higher quality, but I doubt it. As you can see on their site, consumers can purchase a Large for the same price as the smaller square Artisanal version. But that’s not what it’s about either. It seems to be about having fun and providing an opportunity for consumers and employees to share in that fun as well. When you order one of these pizzas, the box will be signed by the person who made it. How much more exciting can it get? Certainly, it should add at least some sarcastic fun for the employees. Is it a matter of time before people start posting the weird names that are signed by the Domino’s Artisans?